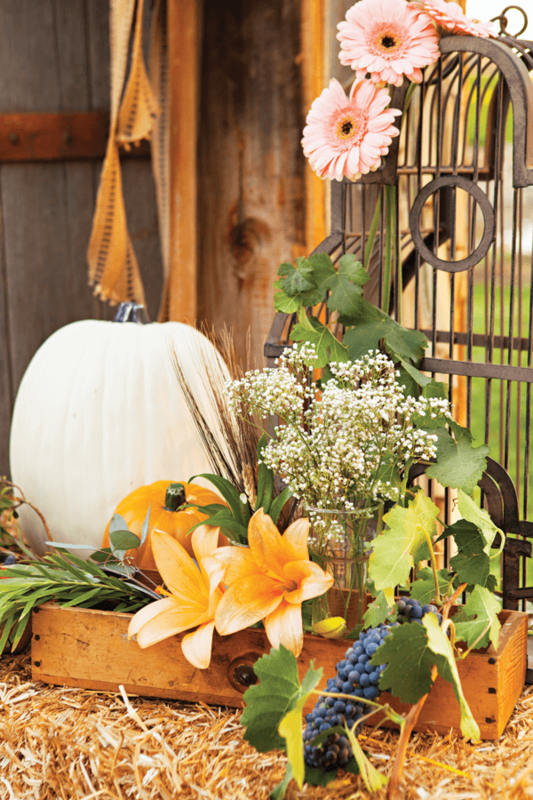 Host a rustic, outdoor harvest dinner with a blend of farmhouse style and vineyard romance perfect for fall. 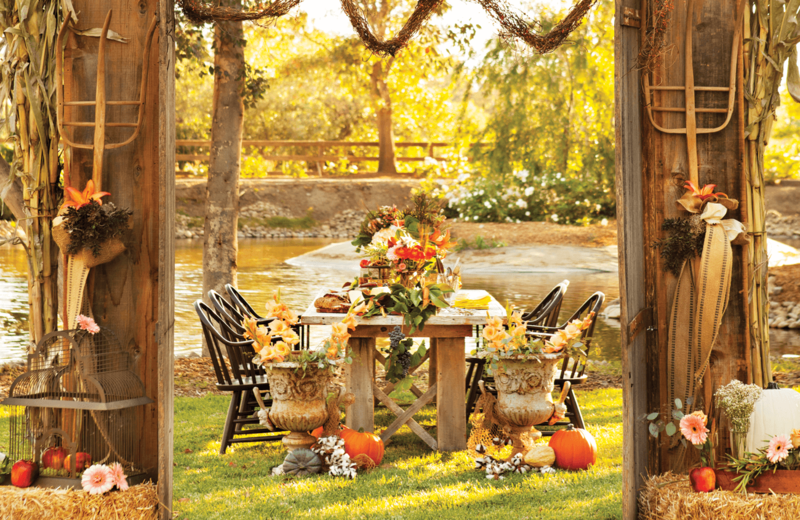 What better backdrop is there for a harvest dinner party than the brilliant colors of the sunset and crisp autumn leaves? 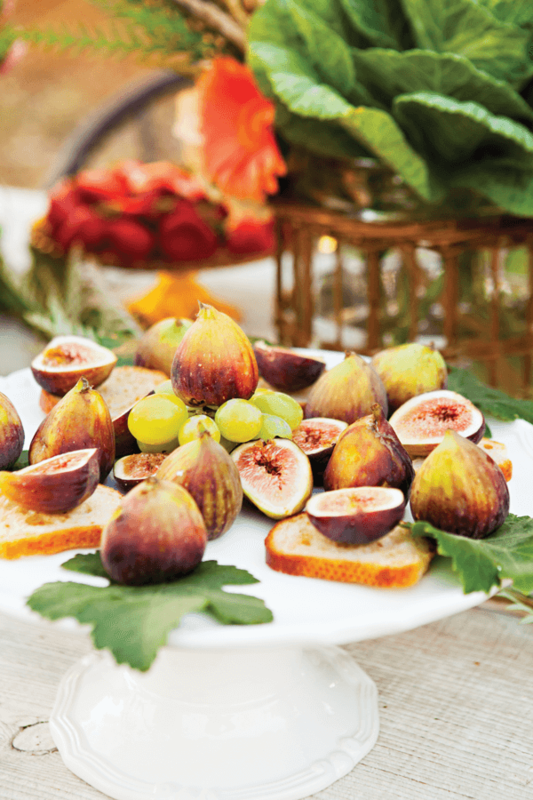 Inspired by the warmth and beauty of Southern California weather and the vineyards of Lorimar Winery in Temecula Valley, Sylvia Asmussen created a farmhouse harvest dinner celebrating the season of plenty. 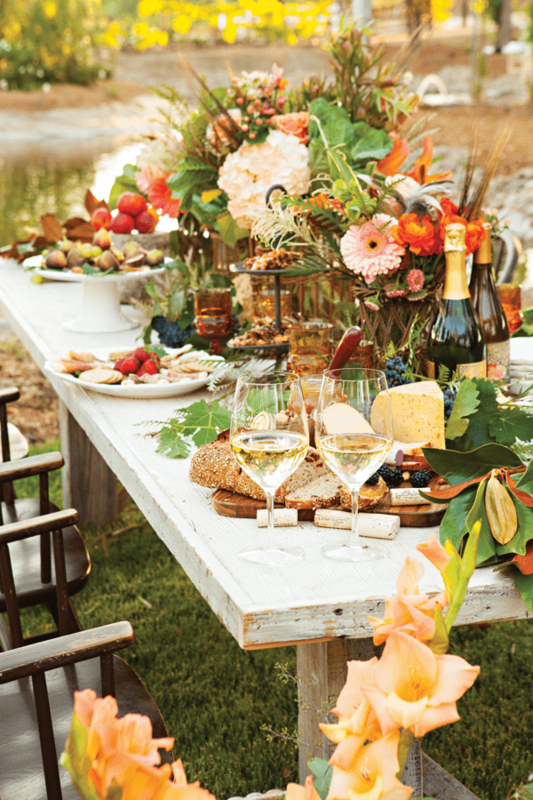 The owner of Madam Palooza, a vintage wedding and special events styling company, Sylvia considers fall the “perfect time to gather your friends and family for some outdoor fun,” since it kicks off the beginning of the holidays. Sylvia set up old barn doors to create a grand entrance to the outdoor dining area. 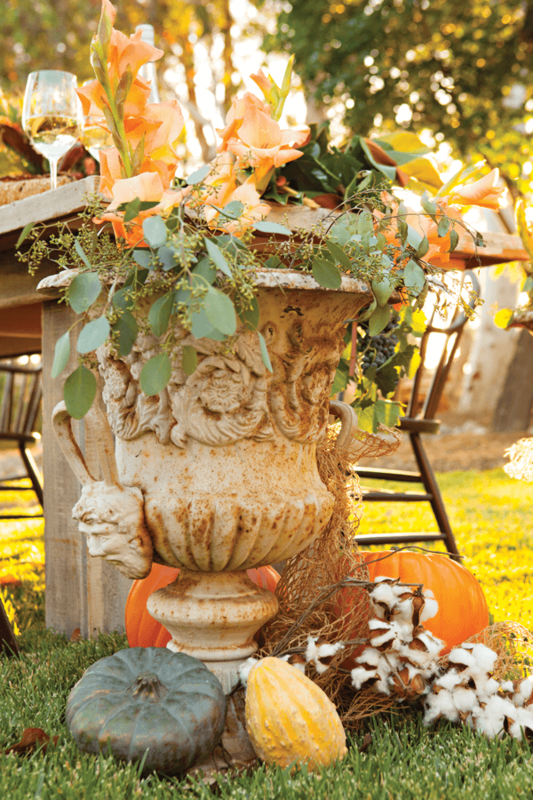 Layering flowers and farmhouse elements around it adds interest and softens the transition. 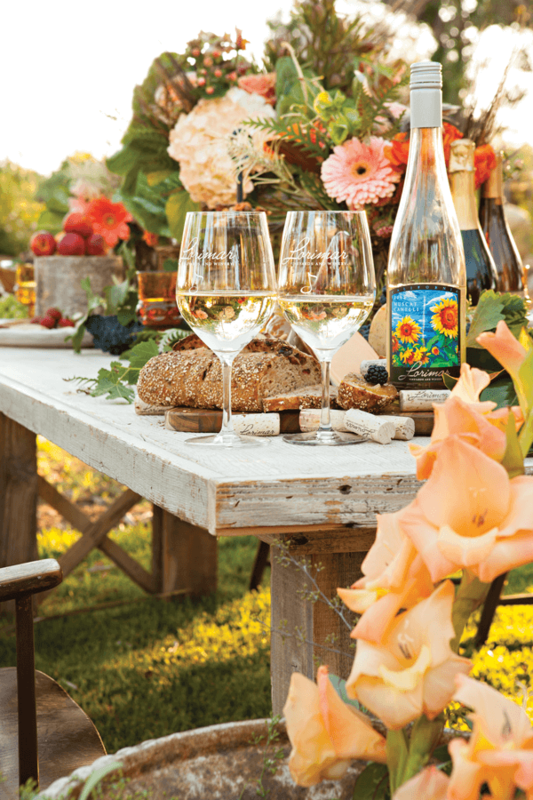 A vineyard-inspired dinner is not complete without a few glasses of wine. 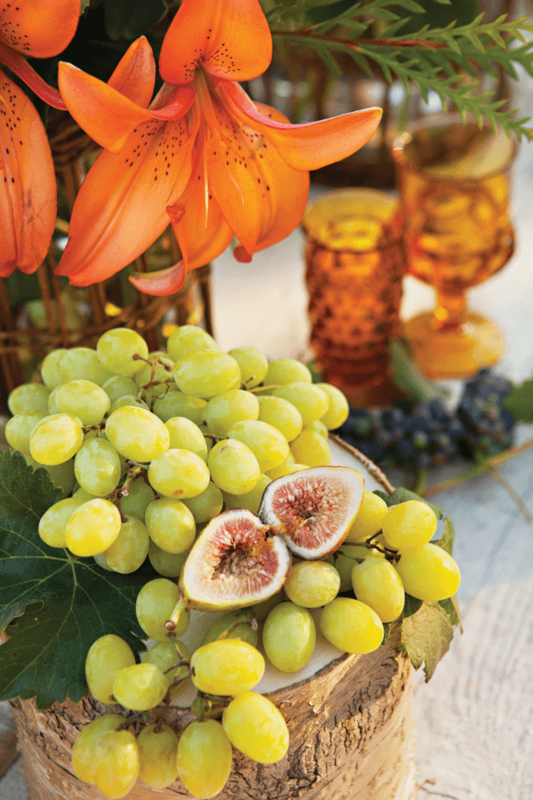 Lorimar Winery’s Muscat is a sweet, fresh pairing for a crisp day. From vineyard to table. Every element of the table setting, from the gorgeous floral pieces to the plate of cheese and crackers, is part of the décor. 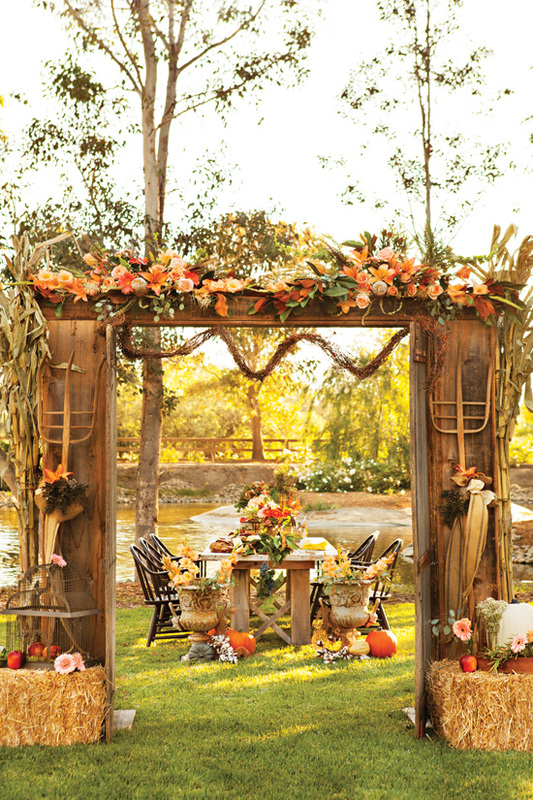 By following her usual principles of styling—reuse and repurpose—Sylvia brought the rustic and the romantic together for this harvest dinner in divine matrimony. “Use what you have around your home already. Think outside of the box and be creative,” Sylvia encourages. Her collection of metal birdcages was softened up with a sprinkling of roses and lilies, European wooden farm elements were paired with traditional textiles for a touch of Old World charm, and planters with a patina finish were juxtaposed with fresh fruits, gourds and bales of hay to give them a fresh personality. It’s important to always be prepared. Have cozy blankets readily available for when the temperature drops in the evening. Incorporate nature into your table setting by using logs or sliced wood as serving plates. I love color, so flowers are always a simple way to add a pop of color,” Sylvia says. “Whether they’re on an entry table to welcome guests or incorporated into your tablescape, flowers can add so much charm to your harvest décor. As a professional stylist, Sylvia has mastered the art of tabletop décor. 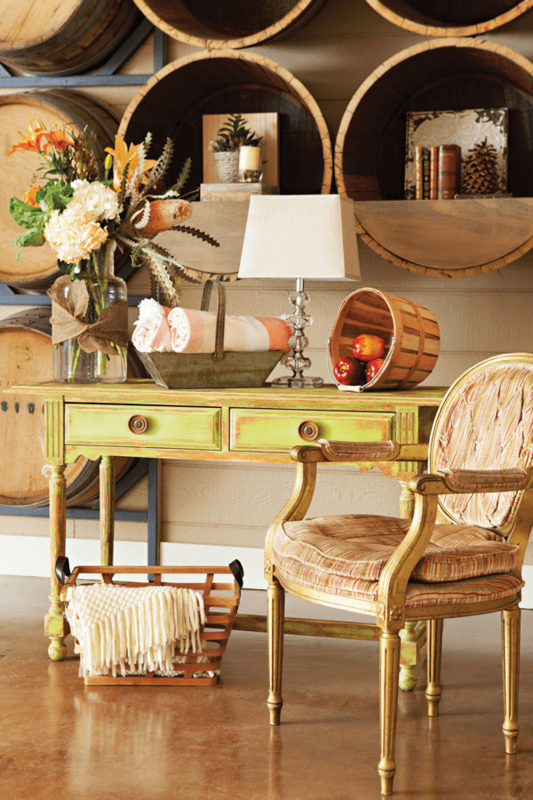 She enjoys bringing out all the fun, vintage pieces she finds at estate and yard sales for dinner party events. For the table setting, she suggests mixing flatware and dishes that have been handed down through the generations. “In my case, I have an aunt who gifted me with some of her family heirlooms. It gives me great joy to know that these things from the past are being enjoyed by others,” Sylvia says. 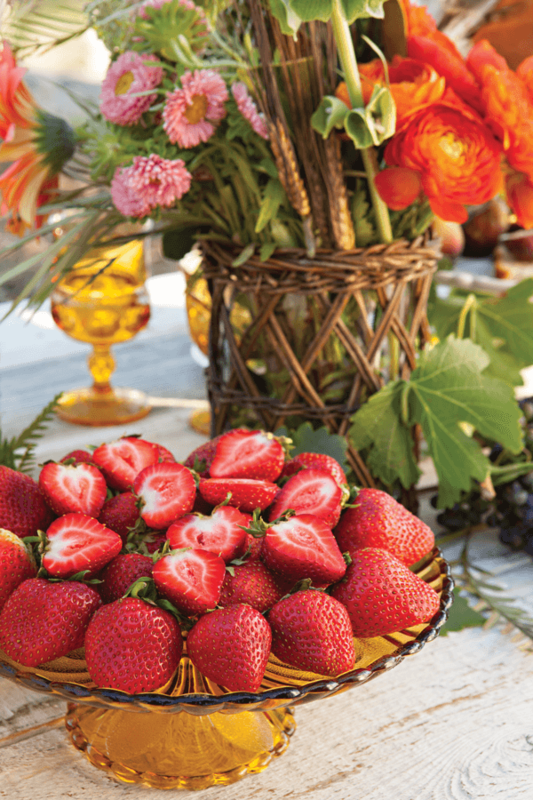 Mix flowers and fruits for a warm, tasteful display. 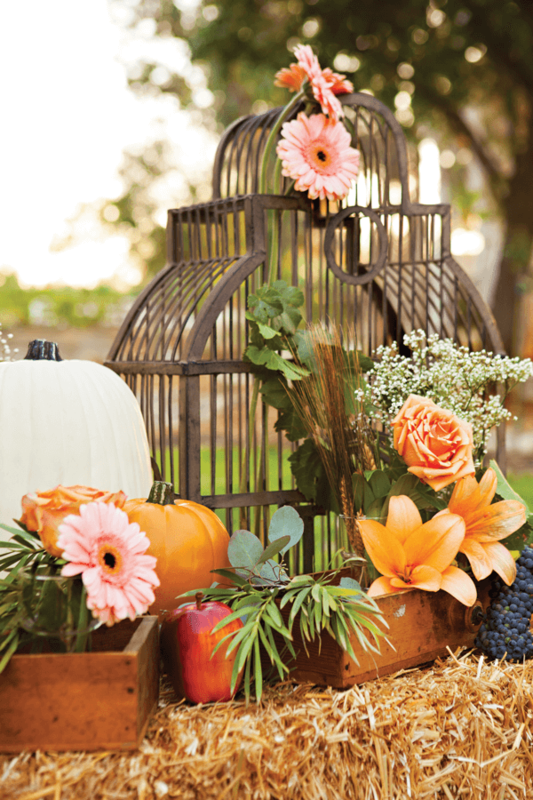 Floral designer Jenelle Jackson of Sweet Flowers Weddings and Events, created stunning fall-themed centerpieces inspired by the wine-country colors. Here she shares her approach to creating flowery showpieces for any occasion. Burlap is a fall essential. 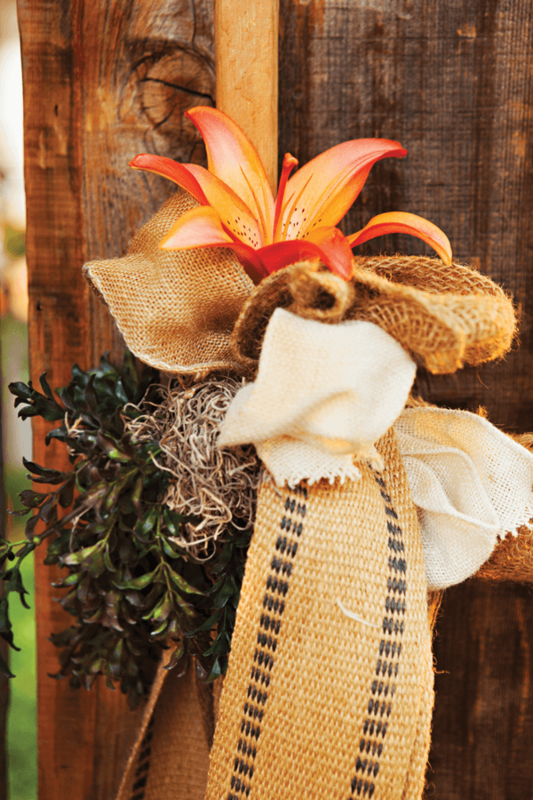 Use it in a new way this year by tying it into a ribbon with other fabrics and leafy stems. Begin with a theme. Simply pulling together flowers that look beautiful on their own will not necessarily create a cohesive masterpiece. Jenelle suggests grouping hydrangeas, calla lilies, dahlias, ranunculus and some berries with fresh kale for an elegant look or, for a more casual country style, gathering up sunflowers, mums, gerbera daisies and a few roses. Consider the location and setting. There are so many ways to display your flowers—in different sized containers, right on the table, in napkins or even on the backs of chairs. Also, for outdoor events, select hardy flowers that can withstand the heat. Choose a container or vase. “You never want the vase to overpower your flowers,” Jenelle says. A rule of thumb is to keep the height of the flowers coming out of the top of the vase taller than the height of the vase itself. Decide whether you want a tall arrangement or a short one. This will be determined by the size of your vase as well as the weather conditions. Avoid tall arrangements in windy areas because they will fall over. Throw in a couple nonfloral elements. Some of Jenelle’s favorite items for the season include feathers, berries, dried grains, gourds and fresh fruit.